Your gut is more than just the organs in your belly. It contains your microbiome, which is an assortment of bacteria, viruses and yeast that live and are native to your gut. The gut also houses the majority of your immune system, and this is where many cells are produced to keep you healthy on a day-to-day basis. Endometriosis can have a huge impact on your gut. It’s important to remember that although we don’t know why endometriosis happens, it’s both an inflammatory disease as well as a disease dependent on estrogen. New studies have shown that endometriosis affects the immune system in a significant way. Specifically, it affects both the production and quantity of immune cells within the peritoneal fluid. The peritoneal fluid is the liquid produced in your abdominal cavity, which covers most of your organs. These are non-specific immune cells that defend against bacteria by killing them. In endometriosis, studies have found that this ‘killing’ function is reduced in peripheral and peritoneal natural killer cells. Therefore, endometrial cells are more likely to survive within the peritoneal cavity, potentially leading to the development of endometriosis. Macrophages are also non-specific immune cells that find and ‘gobble’ offending material in your body. Research shows that macrophage numbers are elevated in peritoneal fluid of women with endometriosis. While these cells are abundant, there is often reduced ‘gobbling’ activity and they often produce higher amounts of pro-inflammatory cytokines. More inflammation creates a favourable environment for developing endometriosis. Lastly, macrophages also lead to the development of new blood vessels, necessary for endometrial growth. These cells are specific immune cells that maintain tolerance, meaning they can prevent an immune response to a particular threat. Although there may be higher numbers of this particular cell, there may be decreased activation. This is particularly important if there is a threat, and these cells are not responding to it. Research shows that this can exaggerate local inflammation and cause growth of new blood vessels, facilitating endometriosis progression. The gut microbiome has the ability to impact estrogen levels. When you have an imbalance of gut bacteria – from a lower number of beneficial bacteria, a potential overgrowth of ‘bad’ bacteria, or even yeast/parasites can occur – this is known as dysbiosis. Gut dysbiosis may lead to the production of an enzyme called beta-glucuronidase. When your liver metabolizes estrogen, it tags it and sends it down to your bowels to be excreted. If you have dysbiosis and constipation, this means that the tagged estrogen is sitting in your large intestine longer that usual. Bacteria producing beta-glucuronidase can act on this tagged estrogen and un-tag it, allowing it to become free and re-enter your system. The gut microbiome of endometriosis clients may house a large number of beta-glucuronidase producing bacteria. This may lead to increased levels of estrogen metabolites and drive the proliferation of endometriosis. Supporting your gut health is something that you can start doing at home. Because endometriosis is already an inflammatory condition, it seems worthwhile to decrease any further inflammation. Food is commonly a big source of inflammation, particularly gluten and dairy-containing products. 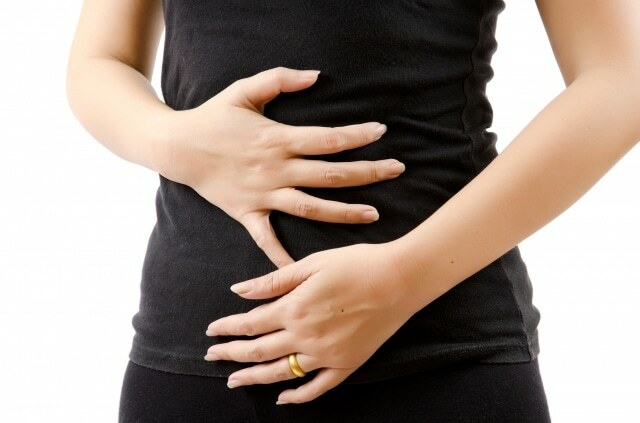 One study showed that a gluten-free diet improved the symptoms of pelvic pain in women with endometriosis. Going gluten and dairy free is a good starting place when decreasing inflammation. However, other foods may be causing inflammation. They can be discovered through an elimination diet or food sensitivity testing. Beta-glucuronidase levels are increased with gut dysbiosis therefore, repopulating your gut with beneficial bacteria may decrease these levels as well as shift your overall microbiome. Adding fermented foods like kimchi and sauerkraut to your diet, as well as drinking kombucha or kefir will introduce beneficial bacteria into your gut. Lastly, adding a multi-strain probiotic may also help. Each time you eat a meal, movement is occurring in the gastro-intestinal tract. If you are experiencing constipation, it is important to determine the root cause. Oftentimes, it can be as simple as drinking more water and eating more fruits and vegetables. Sometimes, it requires a bit more investigating, for example, food sensitivities or nutrient deficiencies may be the cause. For more information about endometriosis or to learn if dietary and lifestyle interventions are right for you, you are welcome to schedule a visit with our Naturopathic Doctor, Dr. Alexsia Priolo. Baker, James M. et al. “Estrogen–Gut Microbiome Axis: Physiological And Clinical Implications”. Maturitas, vol 103, 2017, pp. 45-53. Elsevier BV, doi:10.1016/j.maturitas.2017.06.025. Izumi, Gentaro et al. “Involvement Of Immune Cells In The Pathogenesis Of Endometriosis”. Journal Of Obstetrics And Gynaecology Research, vol 44, no. 2, 2018, pp. 191-198. Wiley, doi:10.1111/jog.13559. Marziali, M, and T Capozzolo. “Role Of Gluten-Free Diet In The Management Of Chronic Pelvic Pain Of Deep Infiltranting Endometriosis”. Journal Of Minimally Invasive Gynecology, vol 22, no. 6, 2015, pp. S51-S52. Elsevier BV, doi:10.1016/j.jmig.2015.08.142. Tanaka, Yukiko et al. “Exacerbation Of Endometriosis Due To Regulatory T-Cell Dysfunction”. The Journal Of Clinical Endocrinology & Metabolism, vol 102, no. 9, 2017, pp. 3206-3217. The Endocrine Society, doi:10.1210/jc.2017-00052.